I was granted an Australian Visitor (subclass 600) Visa through the inmi.gov.au online system. The visa-granted letter shows all my basic data correctly. However, the letter shows my passport number wrong (they put the Series Number of my passport instead) although I filled my visa application with correct data. I checked the Visa Entitlement Verification Online (VEVO) website entering the Series Number of my passport instead of my passport number and the visa is verified. Shall I be concerned? Should I request for a corrected visa-granted letter? Thanks for your comments. Australian visas are completely electronic and are linked to your passport number. 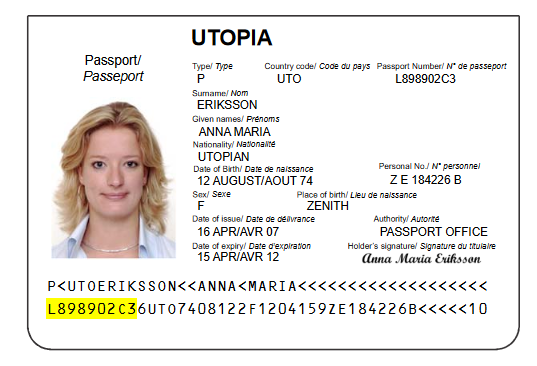 The passport number is the number appearing on the second line in the machine readable zone of your passport, as highlighted in the image below. If the passport number shown in your visa grant letter does not match the one in your passport, then there would be an issue. Airlines check your visas electronically against Australian government systems using your passport details. At the very least you will experience delays when checking in, as the check-in system will not be able to find the visa record. At worst you will be denied boarding. The Department's website contains instructions on updating the passport number. Not the answer you're looking for? Browse other questions tagged australia e-visas or ask your own question.